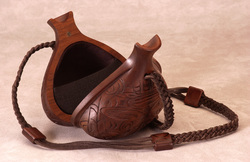 _ Kimberly Chalos is the owner, designer, and artist of Hand Carved Handbags Etc. Formally educated at the University of Southern Indiana, she studied under renowned professor John McNaughton. Kimberly's designs have won numerous awards and scholarships, including a Design and Creativity Award at the International Woodworking Fair. She has also been featured at many galleries throughout Indiana, and Kentucky, including the Indiana Museum of Art, and the Kentucky Museum of Art and Craft. While sculpture has always been a defining part of her artwork she realized making a living from her sculptures was not an easy accomplishment. Kimberly worked for Karges Furniture in her hometown of Evansville, Indiana, making beautiful hand carved furniture. During this time she became interested in primitive art of different cultures. While making a reproduction of a northwest coast Tlingit rattle, she noticed the rattle sitting upside down on her work table. She thought, what a unique handbag it would be, from that thought came a whole line of beautiful handcarved handbags. In 2004 Kimberly launched her business, Hand Carved Handbags Etc.